common doc comment errors like wrong types or missing type annotations for @param and @return comments. It will both check existing doc comments and try to infer missing comments using our powerful type inference engine. It will also add all patches created by our coding style fixer. All checks which supply automated patches are prefixed with [Automated Patch] in the checks editor. all auto-corrections supplied by Rubocop for which cops have been configured. Rubocop provides a list of all cops that can generate auto-corrections here. Note: Downloading and creating pull requests for automated patches is only available with some subscription models. Users with other subscriptions as well as trial users will only be able to see the patches. You can download the patches or Scrutinizer can send you a pull-request if your repository is hosted on GitHub or Bitbucket. To see the patches, choose an inspection from the list of inspections. All available and new patches will be shown in the Patches tab. 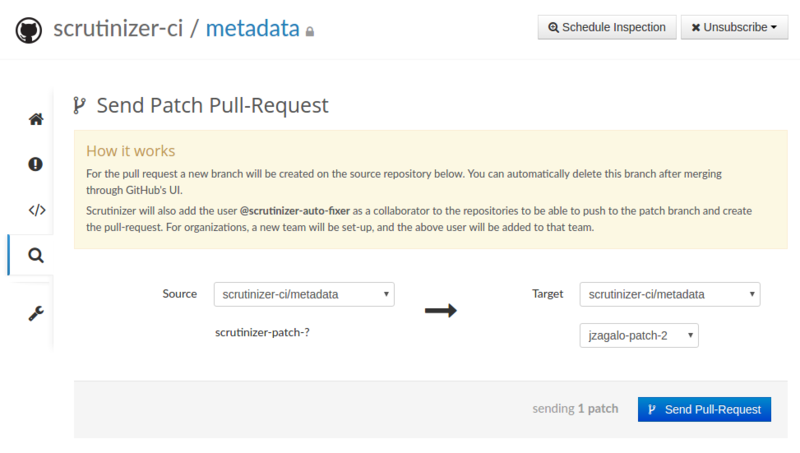 Scrutinizer offers you two views for patches. One that shows only the patches which were newly created for this inspection and another which shows all patches for the entire project. You can always toggle between these views. From the list of patches, you can chose to either apply all patches, or manually review the patches. When you manually review the list of patches, you can decide which patches to add and which ones to discard. Discarded patches will not be shown again in future inspections. You can always undo the discard if you want to. Just toggle the patch again and click the word undo next to the discarded block. For more complex patches, there may be several code blocks. You can choose which blocks to discard and which to keep. The Add Patch button adds the patch to the list of patches that will be part of the patch file or pull request. You will see it appear in the Selected Patches popup in the top right corner of the browser. Once you have reviewed all your patches and added those you wish to apply, you can do so from this popup. The Add all Patches button will add all patches that have not been discarded. It looks at the current filter settings to decide what to add, so you can choose to add only new patches or only those of a particular category. You can download the selected patches or have Scrutinizer send a pull-request to your repository. If your repository is hosted on either GitHub or BitBucket, Scrutinizer can create a pull request for all selected patches. Simply click the Preview Pull Request button. 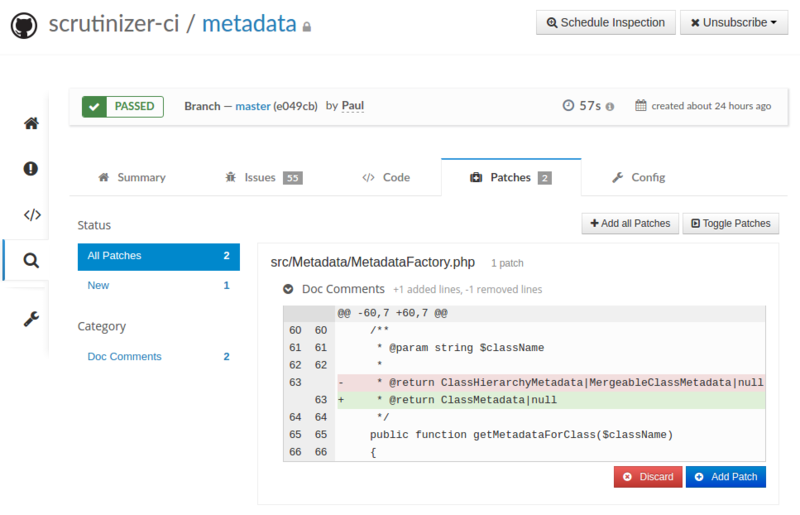 Note: Scrutinizer creates a new branch for the pull-request, so it cannot interfere with other git actions. Once you have sent the pull request, it will appear in your hosting service's interface for you to merge.